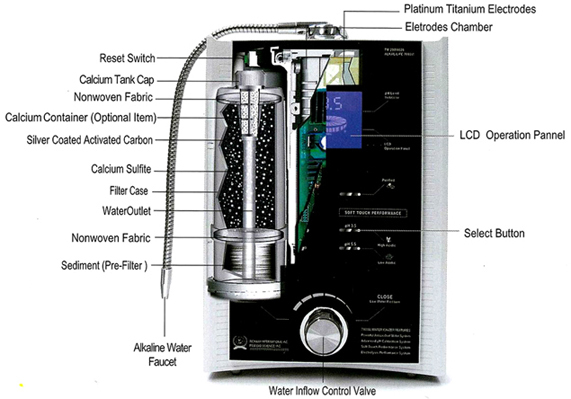 The Richway Alkal Life 7000sL is an advanced water purification and ionization machine. 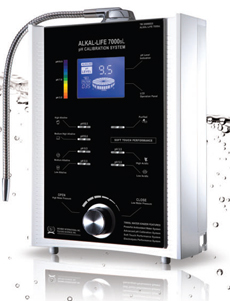 The Alkal Life produces ionized alkaline water which is absorbed into body cells much faster than regular water, hydrating the body much more efficiently. Alkaline water helps the body balance your internal pH levels. 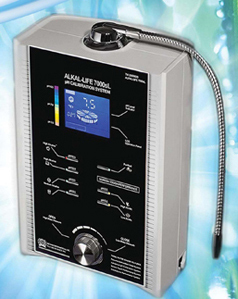 Alkaline ionized water contains an abundance of Hydroxyl ions. Hydroxyl ions irradicate free radicals which are unstable oxygen molecules that do damage and disease to our bodies. Once the Hydroxyl antioxidant and free radicals have cancelled each other, the result is extra oxygen and energy. Alkaline water can help with stomach cramps, colds, the flu, rashes, excema, burns and athletes foot. Alkaline ionized water is different from the regular water. It contains ions and can enter our body cells three times faster than ordinary tap water. The molecular structure is smaller than that of normal tap water, thereby allowing more hydration and faster detoxification. Alkaline ion water tastes "wetter" than ordinary water. The molecules are smaller (6-7 per cluster) than tap water. This small cluster size makes the ion water super-hydrating, more absorbant. Since our bodies will have more water to work with, it can deliver more nutrients. Although this small cluster size enables our bodies to easily absorb nutrients, it is also able to transport nutrients and eliminate waste within a half hour (it takes our bodies 2.5 hours to do the same thing with ordinary water). 1. Alkaline water is a powerful liquid anti-oxidant that is easily absorbed into the body and irradicates free radicals. 2. Alkaline water has ions (lots of them) to balance and maintain a proper body pH (6.9-7.2). This creates an environment that prevents bacteria, inflammation and disease. 3. Alkaline water has a smaller molecule structure. This facilitates more hydration, better nutritional intake and faster detoxification. The Rejuvena sL generates ultrasonic vibrations and the 30,000/vps setting sends nutrition into the skin through the Netzschicht layer. The result is healthy and vibrant skin and increased blood circulation, eliminating wrinkles. The effect of the microvibrations of ultrasonic massage is the double effect of a pull and push movement in a vacuum, the micro-vibrations generated by ultrasonic massages the skin cells. 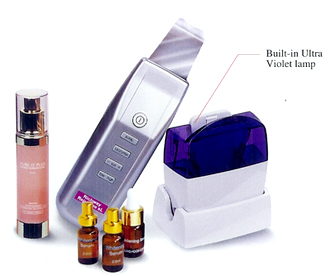 When the skin cells are influenced by the micro-vibrations, the waste material, free radicals and toxins are removed. When Negative Ions are used, it increases blood circulation and it penetrates deeply into the skin. This removes wrinkles, contracts the sweat pores, and makes the skin supple. The stimulus of Negative Ions massages face muscles, removing deep wrinkles. The Rejuvena sL was developed considering various characteristics of the body. You will see the better results of moisturizing and preventing wrinkles with the Ionized Vitamin C.